These Chocolate Candy Cane Truffles are a tasty twist for a homemade Christmas candy that everyone will love. During this hectic season, this is a recipe that will let you enjoy the simplicity and mouthwatering flavors without a lot of hassle. I love Christmas! Mostly it is because I always associate it with the celebration of the birth of my Lord and Saviour, Jesus Christ. Life wouldn't be worth living without Him! It is easier to put diets aside and just enjoy the simple pleasures of life at this time of year. There are a number of different chocolate Christmas candy recipes to choose from. I found a new one I thought you might like to try this year. This combination of rich chocolate and minty candy cane is an interesting and delightful blend. I hope you enjoy it as much as I do. Now, don't be stingy! Share your Christmas candy recipes with the rest of us. You can also comment on and rate those submitted by other guests. Join the fun! In a mediums sized bowl, beat cream cheese with a mixer until creamy. In a medium saucepan or in a double bowler melt 8 ounces of the chocolate over low heat until melted. Add to cream cheese and mix well. Cover and chill (at least one hour). Shape mixture into balls and place on a baking sheet lined with waxed paper. Melt remaining chocolate and dip balls into the chocolate until well coated. Return to wax paper. Sprinkle with the crushed candy canes before chocolate sets. Refrigerate until firm. Store in refrigerator in an air tight container until just before serving. 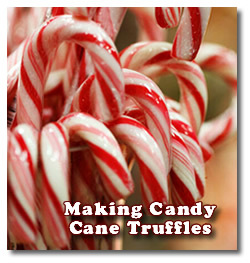 As an alternative, you can substitute the candy canes for chopped nuts, sprinkles, jimmies, coconut, or candy confetti. This wonderful chocolate truffle candy recipe can really be used for any occasion, not just as Christmas truffles. 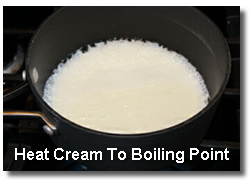 Heat cream in saucepan just until it reaches boiling point. Remove from heat and stir in chocolate until melted completely. Stir in flavoring. Refrigerate mixture until firmly set, but not hard (30-60 minutes). Keep an eye on it so it doesn't get too hard to scoop. Using a tablespoon or melon baller, scoop out and roll into balls. Roll in crushed candy canes and place on waxed paper lined tray. Refrigerate again until firmly set. Store in an airtight container in the fridge. Mmmm. Wonder how long they'll last in there? 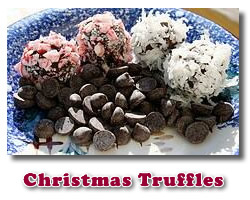 Don't forget to tell us what you think about these candy cane truffle recipes and share your own with us!